Huber needles are hollow needles that have slant tip to make it easy to go throw skin. These needles are used in chemotherapy, drug delivery, transfusion and blood sampling through the implanted port septum which is surgically rooted into skin. A Huber needle is an alternative to other delivery systems used for infusion as they are used with patients that need repetitive vascular access and fluid therapy for long term and is specially designed to be used with implanted ports. The global huber needles market is expected to grow at a CAGR of 6.2% over the forecast period i.e. 2017-2024. Further, huber needles market is anticipated to reach USD 60 million globally by 2024. The growth of huber needles market is propelled by the increase of deadly diseases such as cancer, chronic renal diseases and obesity across the globe and robust development of healthcare infrastructure. Moreover, these chronic diseases are creating a massive opportunity for companies operating in the global huber needles market. Geographically, North America has been a leading huber needles market in terms of market demand and is anticipated to continue its dominance over the forecast period owing to a high diagnosis rate and increasing adoption of huber needles for long-term infusion therapies such as chemotherapy and dialysis. The prominent country witnessing the augmented demand for huber needles in North America is U.S. Furthermore North America is expected to be the most lucrative market in future, owing to presence of large manufacturing companies of huber needles market in this region. Europe is projected to hold a substantial share in the global huber needle market. The high growth in this region is attributed to the presence of a large number of manufacturing vendors and the availability of advanced healthcare infrastructure. 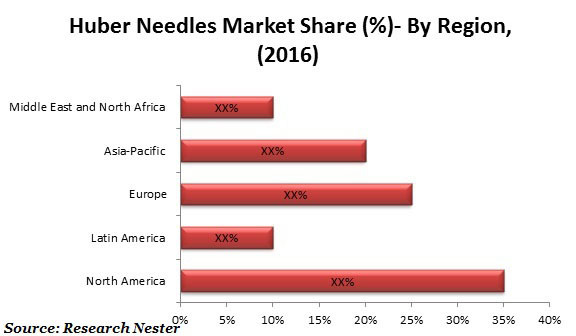 Latin America is also expected to observe significant growth of huber needles market over the forecast period, owing to development of healthcare infrastructure. The market of huber needles is growing on the back of the government regulations to minimize the needle stick injuries. Further, various reimbursement policies of the needles by the government are fostering the growth of huber needles market over the forecast period. Moreover, rising disposable income and advancement in healthcare services in developed region is likely to foster the growth of this market. Apart from this, increasing deadly diseases such as cancer and others are likely to grow the market of huber needle market. Although, high cost associated with the manufacturing of huber needle product is believed to dampen the growth of global huber needle market. Additionally, lack of technological advancement and contamination risks are anticipated to further restrain the growth of the global huber needle market.